After the horrific news about Manchester this morning, I couldn’t settle to work and went out. 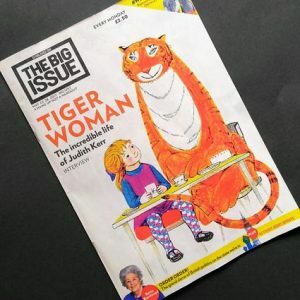 A Big Issue seller was standing on the corner of Seven Dials in Covent Garden with the latest edition, headlined Tiger Woman, the incredible life of Judith Kerr. I bought a copy, and the man and I got chatting. He did most of the talking. C has been sleeping rough since losing his job and home in the Wirral. “There are seven of us who’ve lost our homes, we sleep together in such-and-such Street and we look out for each other,” he told me, “it’s surprising what you get used to if you have to. There are business people around – we call them the Blue Suits – who insult us for being homeless, but I say to them ‘you’re only two pay cheques away from being like us! '” C is a heritage stonemason, originally from County Clare. “When I got to London from the Wirral I managed to get a job as a brickie on building sites, but I was too slow, I’m a trained craftsman you see, I’m used to working on listed buildings,” he explained. If you can’t find a Big Issue seller you can subscribe. *Big Issue later picked up on this and asked if they could use it. It appeared as their Comment of the Week on June 1st 2017. 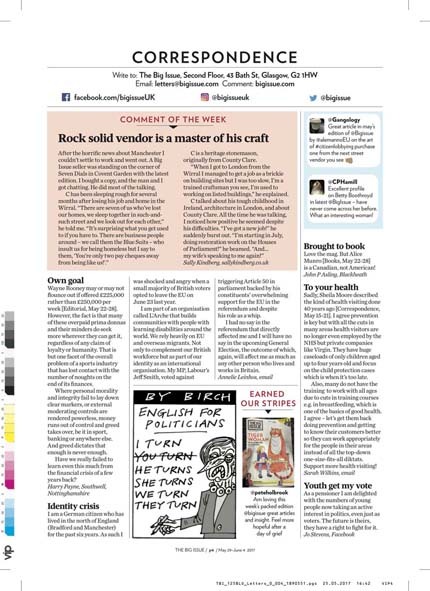 This entry was posted in Events and tagged Big Issue, County Clare, Grace O'Malley. Bookmark the permalink. What a brilliant story! Good luck to him!